Well, what do we have here but yet another unbalanced Sherlock episode. The Sign of Three, like a lot of Sherlock, has some good things in it that kept it afloat. It also, like a great deal of Steven Moffat and Mark Gatiss' work, has things that contradict each other. It's no surprise given that The Sign of Three has three credited writers (Moffat, Gatiss, and Steve Thompson), though at the moment I'm not sure exactly who wrote what. At first I though the two cases Sherlock Holmes (Benedict Cumberbatch) waxed rhapsodic about in his long and rambling toast to the newly-married John Hamish Watson (Martin Freeman) were written individually by two of them, with the overall story by a third. However, like a lot of Sherlock, the details are bit muddled. It doesn't help that one of the architects to this is Thompson, who has given us some of the worst Sherlock episodes (The Blind Banker and The Reichenbach Fall), as well as some of the worst Doctor Who stories in the entire run of that show (Curse of the Black Spot, Journey to the Centre of the TARDIS, and most recently, Time Heist). Thompson's total average for his oeuvre (three Whos, two Sherlocks) is a dismal 2.4, so going into The Sign of Three we already started out badly. In terms of story, The Sign of Three contradicts its own thinking. 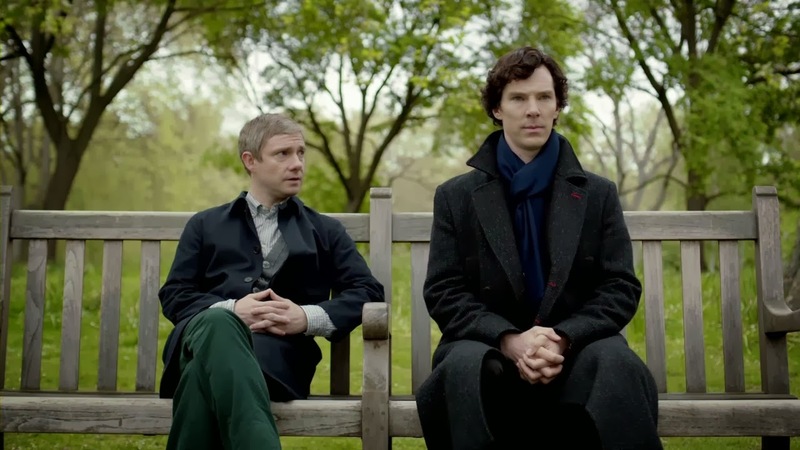 In terms of performances, we see what potential Sherlock has for its characters. Sherlock Holmes is facing a great crisis: writing the best man speech for Watson's wedding to Mary Morstan (Amanda Abbington, Freeman's real-life longtime mistress). If it means calling DI Greg Lestrade (Rupert Graves) from the arrest of his career, so be it. Well, after that bit of comedy the rest of the story takes place at the wedding reception and in flashbacks. Sherlock being Sherlock stumbles at what are called human emotions as he regales the guests with stories about John. The first one involves The Bloody Guardsmen, where Holmes and Watson investigate the case of Private Bainbridge (Alfred Enoch, who incidentally is the son of William Russell, one of the first Companions on the original Doctor Who). Bainbridge contacts Holmes and Watson because he's convinced someone is stalking him. As Holmes and Watson investigate, they find that Bainbridge is indeed murdered while showering alone in the barracks with the shower door locked from the inside. While they didn't solve the crime, it was Watson's compassion towards the soldier rather than Holmes' cold investigative efforts that Holmes holds in high regards. The second involves The Mayfly Man. As part of his duties as best man, Sherlock Holmes is required to take John on a beer crawl. He has measured everything perfectly, right down to the amount of alcohol they can consume without being entirely intoxicated. John, however, sneaks in a little extra alcohol, which results in Sherlock Holmes actually being drunk, getting in a bar fight, and getting locked up. Their arrest isn't related to the fight though. They had gone home and there were consulted by a woman who claimed to have dated a ghost. The boys, still boozed up, make a right mess of things, in Holmes' case quite literally. As John Hamish Watson tells the client that they are "cluing for looks", Sherlock Holmes first falls asleep and then throws up. The case continues as Holmes gathers a group of women who have similarly dated a figure who quickly disappears. He continues to attempt to put things together, but things are still off. As Holmes continues his long and rambling speech he suddenly realizes that one of the guests is in danger. The most likely target is Watson's old commanding officer, Major Sholto (Alistair Petrie), who is blamed for the deaths of young recruits early in his career. Holmes discovers that both the Bloody Guardsman case AND the Mayfly Man case are connected, and they are connected to John and Mary's wedding day. He does find the man who attempted to kill Major Sholto with a blade hidden in his buckle that delays the stabbing after its removed (which is how Bainbridge was murdered). The murderer is the person masquerading as the wedding photographer, Jonathan Small (Jalaal Hartley), brother of one of the men killed under Sholto. Holmes also makes the deduction that Mary is pregnant, and while everyone dances the night away, Sherlock Holmes (who confesses to the maid of honor that he secretly loves to dance) walks away, barely noticed in the revelry. Here's the thing with The Sign of Three that EVERYBODY'S missed. Appearing as a figment of Sherlock's imagination, his brother Mycroft (Gatiss) tells him that coincidences are to be rejected. YET...it IS a coincidence that Sherlock is discussing the two cases in question! What really were the odds that Sherlock Holmes would select THESE two particular cases to discuss in his curiously incoherent speech? This is especially true with The Bloody Guardsman because that case was never solved. Yes, he used it to point out John's compassion, but is it just me, or weren't there other cases that could have focused on John's humanity versus Sherlock's lack of? Given how Sherlock Holmes hates being shown in anything other than the best light, to highlight a case where he was not triumphant seems a bit odd to say the least. We also have the strange situation of Sherlock and John not noticing things that were so plainly obvious. I can't recall if in the Granada series with Jeremy Brett (the BEST Sherlock Holmes...sorry, Sherlockians) Brett told his Watson that the latter was 'a master at observing the obvious'. Here, it was so obvious that Tessa (Alice Lowe) the girl who first contacted them about her ghost, knew more than either realized. She called John by his full name: John Hamish Watson. Yes, you could make the case that because Holmes and Watson were so hopelessly plastered they failed to notice a stranger using John's rather unique middle name (though why Tessa would introduce the doctor by his full name is odd to say the least). However, when Sherlock was having his online conference with the women who dated the Mayfly Man, Tessa made the comment, "Enjoy the wedding". AGAIN, this is so brain-numbingly crystal clear it surprises me that Sherlockians, who have this idea that they are among the intellectual elite, could not have seen this as a clear clue that Tessa knew about something that only those with invites knew: John HAMISH Watson, partner of Sherlock Holmes, was getting married. How is it possible for me to accept that Sherlock Holmes is the brilliant deductionist and overall genius at everything (to where he is almost God-like) but not have him notice something that is so nakedly out of place? I also think that the whole mystery was rather flat. Throwing in the names of Major Sholto and Jonathan Small from Sir Arthur Conan Doyle's The Sign of Four does not make me think this was a brilliant variation on Canon. It's almost as if there HAS to be some sort of crime because, well, it's Sherlock. What did elevate The Sign of Three were the overall performances. Benedict Cumberbatch really is a marvel as Holmes, his ability to find the humor in Holmes' inability with humans. When he stares blank-faced to Watson asking him to be his best man is delightful. His entire drunken sequence with Freeman was also amusing. Not laugh-out loud funny as I imagine Gatiss, Moffat, and Thompson thought it was, but still amusing to see someone as controlled as Sherlock be simply too inebriated to put things together (such as when he can't form words to figure out the mystery presented to him). Cumberbatch I think is generally too smart an actor to not get that Holmes' discomfort with others makes him unintentionally funny. "Gavin Lestrade," he tells Watson when Watson suggests a Best Man. "He's a man and good at it." While I imagine that the concept of a 'best man' is not completely foreign to Sherlock Holmes, it is Cumberbatch's way with the line, as if he is taking Watson literally when he is talking about a 'best man', that makes Holmes' apparent lack of comprehension more amusing. I keep saying amusing because I didn't find it all that funny (as I instantly knew that Holmes' texts to GREG Lestrade would end up as a punchline). Still, everyone made an effort, so bless them. However, for me it was the more quiet, intimate moments of Cumberbatch's performance that were the emotional and artistic highlight of The Sign of Three. The best moment was when Sherlock confesses privately to Maid of Honor Jasmine (Yasmine Akram) about his love of dancing, even throwing in a few twirls. THOSE moments, when we get to see past the strict, stiff veneer of this Sherlock to see someone who could possibly be, underneath all that, a real human being, with all the foibles, emotions, and delights that come with it, that for me are the parts I remember. I can't figure out why Sherlock enjoys making Sherlock Holmes into this waxwork: a being so far removed from us that he deserves to get punched repeatedly. IF Sherlock allowed those little lights of humanity to creep out more often, I might enjoy Sherlock more than I have. Not that weren't actual moments of unintended comedy. In the Bloody Guardsman sequence, Cumberbatch and Freeman were sitting next to each other. I'm sure it wasn't the intention, but to me, the 5'6" Freeman looked like he was the 6' Cumberbatch's puppet. Having them sit side by side made their nearly half-foot height difference a bit jarring to say the least. As for Freeman, he was the slightly bumbling, not-too-bright Watson he's been before. I wasn't overwhelmed. I wasn't even whelmed. Still, to his credit Freeman can appear to be the type of person who could think this cold fish really could be Watson's best friend. Both handled the comedy well (even though, again, I was more amused that straight-up laughing). Gatiss played himself, and everyone else stuck to their usual routine (lovelorn Molly, sweet Mrs. Hudson, still clueless Lestrade). On the whole I think The Sign of Three in terms of both mystery and adaptation of Canon was second-rate. In terms of performances, it was really good. It's unfortunate that Sherlock simply can't balance the two. The story isn't logical (it goes all over the place trying to find mystery and crimes because it feels almost obligated to do so). In terms of human mysteries, The Sign of Three was a good sign that somewhere, underneath the hoopla and Sherlockian fanaticism, there may lurk a good show. Just let Sherlock Holmes breathe a bit, not be a waxwork with no emotion. "All emotions, in particular, love, stand opposed to the pure, cold reason I hold above all things," Sherlock Holmes in his meandering toast tells the wedding guests.